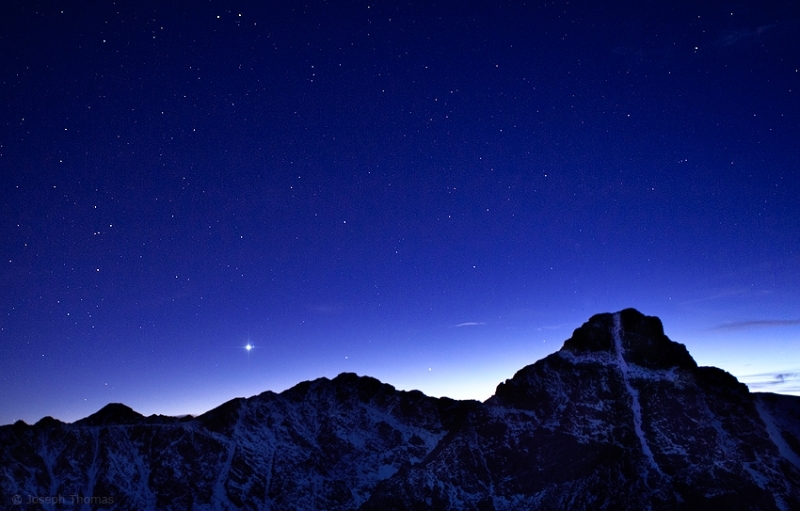 Night falls and stars emerge above Mount of the Holy Cross (14,009â€™) on a cold October evening as photographed from the summit of Notch Mountain (13,237â€™). The prominent star is Arcturus, the brightest star in the northern celestial hemisphere. I ended up spending the night hunkered down on a high plateau just below the summit. A harsh wind was blowing relentlessly at 50-70 mph throughout the night with the wind chill reaching about twenty below. I actually would have been considerably warmer if I had stayed home and spent the night in my refrigerator â€“ or even my freezer for that matter! But what a sight to behold.